but feel hindered by time, experience, opportunity, or fear. Join us for a workshop if you have the desire to make art - regardless of your experience. I will provide the resources, the materials, encouragement and step-by-step guidance. A different painting opportunity 1 night a month. contact me so we can discuss the possibility of scheduling a time. Workshops are held in my home/studio in Winfield, IL. I will give guidance on composition, color mixing, developing light & dark values and maneuvering acrylic paint. We will create on 11x14 inch or 12x12 inch canvases. Workshops are limited to 8 people. I am not talking about anybody's children - who, by the way, will soon be out of school for the summer. I can not wait to see the poppies, cosmos, black-eyed susans, purple cone flowers, daisies and asters (just to name a few) bloom! You are sure to come away with a beauty - a sunflower to bring you sunshine and a smile throughout the year. contact me to schedule your own workshop. The workshops listed are 2 1/2 hours and all materials are included. Do you have a word or short phrase that you would like to focus in on for 2014? OR would you like to paint a name for someone special? I will give guidance on choosing a font to reflect the word(s) or name, arranging the composition, mixing colors, and working with acrylic paint. *The boards are narrow - 3.75 inches 'tall' by 8-12 inches wide. I will have a variety lengths cut, sanded and primed. If you have a board or canvas you would like to paint on, feel free to bring it (prepped) with you. Contact me with any questions. Join us in creating sweet (no calorie) valentines for a treasured friend or sweetheart! Express your heart (pun intended) on canvas with color and acrylic paint. The simple heart shape frees us to focus on our sentiment while exploring and playing with color and a paintbrush. I will give guidance on composition, color mixing and maneuvering the paint. If you want ideas, I've got those too! As a gift, these little paintings will last a lifetime. 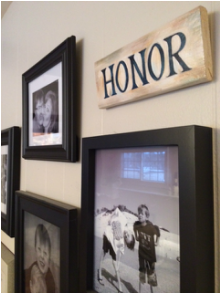 They can be displayed on a nightstand, counter, shelf, desk - or with a grouping of pictures on a wall. I see them as an opportunity to remind someone that they are loved and appreciated - all year long. 'Breaking Through' - on display in the Maternal Fetal Medicine suite at Central DuPage Hospital, Winfield, IL. When I see the sun breaking through the trees, my attention is led away from the day-to-day. In that magical moment, I experience peace. There is hope in such a scene. I have been taking photos of the sun breaking through the trees for a while now. Using those references, we will paint (step-by-step, layer-by-layer) with acrylics on canvas. With clear gentle guidance on drawing trees, mixing color, creating contrasting values (lights & darks), & working with acrylic paint, we will capture the light shining through the tree branches. Daisies are so fresh and full of joy! With plenty of photos for inspiration, and step-by-step instruction, I will demonstrate the basics of constructing daisies and guide us along to create interesting compositions (the way things are arranged). On 11"x14" canvases, we will blend and mix acrylic paint while discovering the layers of color and value found in the 'white' petals. The tulip's delightfully simple shape is loaded with possibilities for exploring color and paint. Join us for a step-by-step guidance into creating your own joy filled expression of spring! On 11"x14" canvases, we will blend and mix acrylic paint while discovering the layers of color and value found in the petals and leaves of tulips.